Paintball can be a fun and different activity to do with your children, young and old! Be sure you’re prepared for the excitement by dressing appropriately, and following safety rules. Protective eye equipment is required at all of these locations, and long sleeves/pants are often recommended to ease the sting of being hit by a paintball. Many of these facilities are flexible with their hours so always be sure to call in advance to make the most of your trip! Located on the southeast side of Indianapolis, Indy Acres Paintball offers gameplay with a .50 caliber paintball, meaning it packs a little more “bite” when you’re hit, so be prepared and wear long pants and sleeves. Since this attraction offers fields and woods, it’s recommended that you be covered to avoid normal outdoor exposures such as insect bites and poison ivy. Indy Acres Paintball offers bunkers, a 2 bedroom style house, and a field for night play. Dark Armies is an indoor facility that is black lit, due to this style of paintball significantly less paintballs are used than a typical outdoor facility. They report an average of 50 paintballs for first-time players. Public play and private sessions are available. There are no set game times at Dark Armies. Game play is available 24 hours a day. Call for more details. This paintball facility has 12 different playing fields including themes such as “Back Alley”, “The Alamo”, “Jungle”, and “Airstrip”. These fields have obstacles such as old helicopters, wooden forts, and cars, each a unique playspace for your enjoyment. White River Paintball also features scenario events that are all weekend paintballing events with hundreds of participants. Upcoming events include “Age of Conquest” in July and “Mob Wars” in November. Admission only is $26, with a basic package including a gun, protective equipment, and 100 paintballs is $35. Check the website for the most accurate daily hours. Paintball Indiana offers group games for corporate, church, or special events, walk on play, and even low impact paintball for children under 10. Low impact paintball feature a smaller ball and a lower velocity. Shooters use s pump-style/spring-driven type of gun to shoot paintballs at a lower speed reducing the paint factor. Walk-on play = $26 and includes gun, mask, ammo pack, and compressed air. Paintballs start as $6 for 100 and go up to $60 for 2000. They also offer season passes, good for 1 year from purchase, for unlimited walk-on play ranging from $150-250. Check website for upcoming walk-on games or to schedule a group. 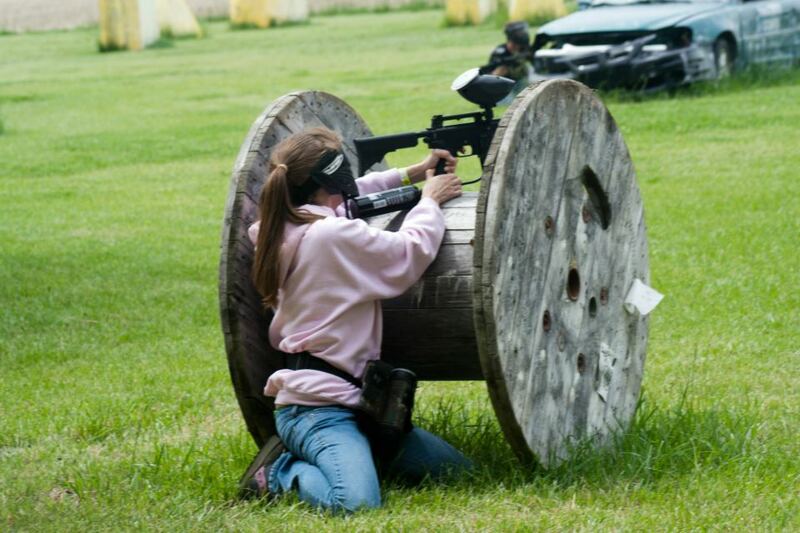 PaintballPLEX offers both indoor and outdoor facilities, with low entrance fees. Both spaces are large, flat areas with large inflatable barriers and obstacles. They offer free 3-man and 5-man style tournaments, with round-robin eliminations throughout the summer and fall. Additionally, every Friday night PaintballPLEX hosts a Friday Night Madness event from 5:30-9.